BWB Global Camp will be hosted during the 2019 NBA All-Star Weekend and will bring together the Top 63 High School Boys and Girls from 31 Countries and Regions. On February 12th, 2019 the NBA and FIBA announced the fifth annual Basketball Without Borders Global Camp. 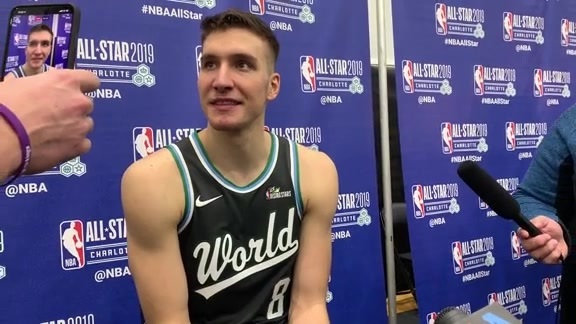 Kings sophomore shooting guard Bogdan Bogdonović will join 2019 NBA All-Stars Nikola Jokić and Nikola Vučević, as well as Phoenix Suns rookie Deandre Ayton to coach the top high school age campers from Africa, the Americas, Asia and Europe. Additionally, Bogi will be joined by numerous NBA and WNBA veterans and Hall of Famers such as Micheal Ray Richardson, Allison Feaster and Festus Ezeli as well as select players participating in NBA All-Star 2019. The camp will feature 10 current prospects from NBA Academies, and five prospects who participated in The NBA Academies Women’s Program. Both academies focus on networking top male and female prospects from outside of the U.S.
Players and coaches will lead the campers through a variety of activities on and off the court, including movement efficiency, skill development stations, shooting and skills competitions, 5-on-5 games, and daily life skills seminars focusing on health, leadership and communication. To follow the camp use the hashtag #BWBGlobal on Facebook, Twitter and Instagram. To find out more about NBA Academies visit nbaacademy.nba.com and follow on Instagram (@nbaacademy). Guess Who’s Back? HB’s Back.